“While representatives of Local Orthodox Churches came to Moscow and Kiev to pray and celebrate with us, the envoys of Constantinople … communicated with secular figures and with people far from the Orthodox Church,” Patriarch Kirill said. Moscow, December 21, 2018 – The annual diocesan meeting of the Moscow Diocese was held yesterday at Christ the Savior Cathedral under the chairmanship of His Holiness Patriarch Kirill of Moscow and All Russia, at which the Russian primate touched upon the egregious interference of the Patriarchate of Constantinople in the internal life of the Ukrainian Orthodox Church, reports the site of the Russian Orthodox Church. This year was very difficult for the whole Orthodox Church and especially for the Orthodox believers of Ukraine. Some politicians and the leaders of the schism supported by them even tried to use the 1,030th anniversary of the Baptism of Rus’, a bright occasion to remember the centuries-old unity of our peoples, carefully preserved since the time of Prince St. Vladimir, as an excuse to split our Church. And the saddest thing is that the Patriarchate of Constantinople supported them in this effort. “While representatives of Local Orthodox Churches came to Moscow and Kiev to pray and celebrate with us, the envoys of Constantinople were busy with others. They communicated with secular figures and with people far from the Orthodox Church,” the primate continued. Pat. 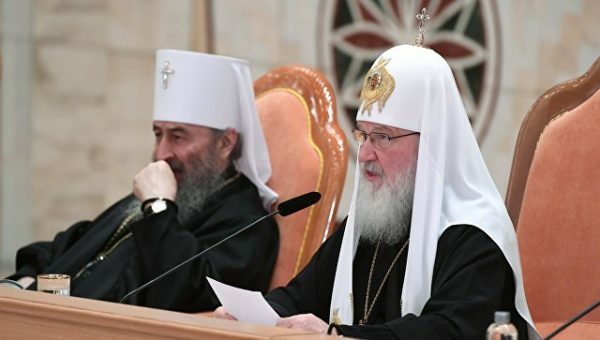 Kirill recalled that following Constantinople’s appointment of two Exarch bishops—a gross violation of the canonical territory of the Ukrainian Church—the Russian Holy Synod resolved to suspend commemoration of Pat. Bartholomew, though this did not prevent Constantinople’s path towards autocephaly in Ukraine. On October 11, the Holy Synod of Constantinople reaffirmed its intent to grant autocephaly to the Ukrainian church, despite the fact that it had no requested it, and to nullify all canonical impediments placed upon the Ukrainian schismatics. “All of this was accompanied by a hypocritical call to refrain from the seizure of churches and violence ‘for the sake of peace and love,’ while the pressure exerted on bishops, clerics, monastics, and laity of the Ukrainian Orthodox Church, who did not want to participate in the anti-canonical initiatives of politicians and schismatics, in fact, became stronger,” the Patriarch continued. As OrthoChristian reported today, the Holy Transfiguration Cathedral in Vinnitsa was taken from the canonical community with the blessing of Patriarch Bartholomew. Pat. Kirill also recalled how Ukrainian public officials began to declare that the faithful of the canonical Church are strangers, denying them the right to their own country. “But we are talking about millions of citizens of Ukraine! In fact, the Synod of Constantinople and its Patriarch sided with the persecutors,” His Holiness testified. The actions of those whom Pat. Kirill has met and prayed with so many times cause him pain, he confessed. Moreover, the entire 20th century is one of painful relations between the Moscow and Constantinople Patriarchates. Pat. Kirill recalled how Constantinople had supported the heretical Living Church in Russia and even tried to depose the great St. Tikhon the Patriarch of Moscow. Constantinople also did everything possible to strike at parts of the Russian Church within reach while it suffered under atheistic persecution: Estonia, Finland, Poland, Latvia, and so on. “We cannot celebrate the Sacraments with those who entered into communion with those who have departed into schism and even with those excommunicated from the Church,” Pat. Kirill explained. On the other hand, speaking of the suffering Ukrainian faithful, the Russian Primate said, “We admire their courage, humility, and spiritual boldness. We pray for them at every Liturgy, we pray for the unity of our Local Church and for the unity of holy Orthodoxy in the world. But we cannot say the same words, ‘Christ in our midst,’ to those who side not with the persecuted but with the persecutors. Therefore, in the current situation, our Holy Synod made the only possible decision,” to sever communion with the Patriarchate of Constantinople. In these circumstances, we should be strengthened in prayer, for the prayer of the Church is a great power. Back in September, the Holy Synod blessed to offer special fervent prayers for the unity of holy Orthodoxy in all the churches of the Russian Orthodox Church at the Liturgy. And I call each of you to fervent, tender, heartfelt prayer for the unity of the holy Churches of God, for peace for the Ukrainian Orthodox Church. Raise these petitions not only during the Divine services, but also in home prayer, repeat them on pilgrimages, call on your parishioners to do this, address with a heartfelt sighing the hieromartyr of the last times—St. Vladimir, Metropolitan of Kiev, the centenary of whose murder was at the beginning of this year, that he might take the threat of suffering away from the Ukrainian Church.